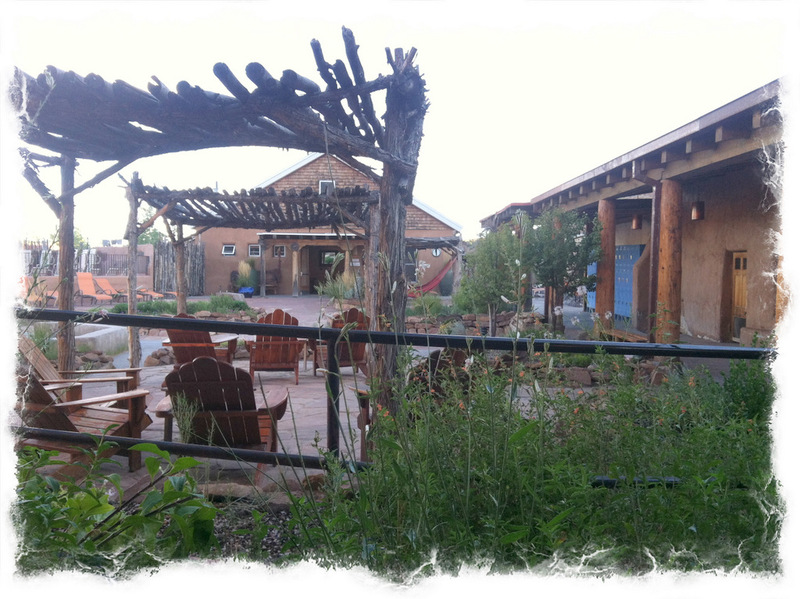 New Mexico Hot Springs: Ojo Caliente – An Unorganized Mind/Musings and Memories with Photos *To view the complete Menu: Click on menu then use the down arrow to scroll down the Menu Categories. My husband and I took a road trip last summer with our destination being Taos, NM. I’d been there before but he hadn’t. As the New Mexico license plates label it “The Land of Enchantment”, I can attest that they chose a perfect description of this enchanting land. 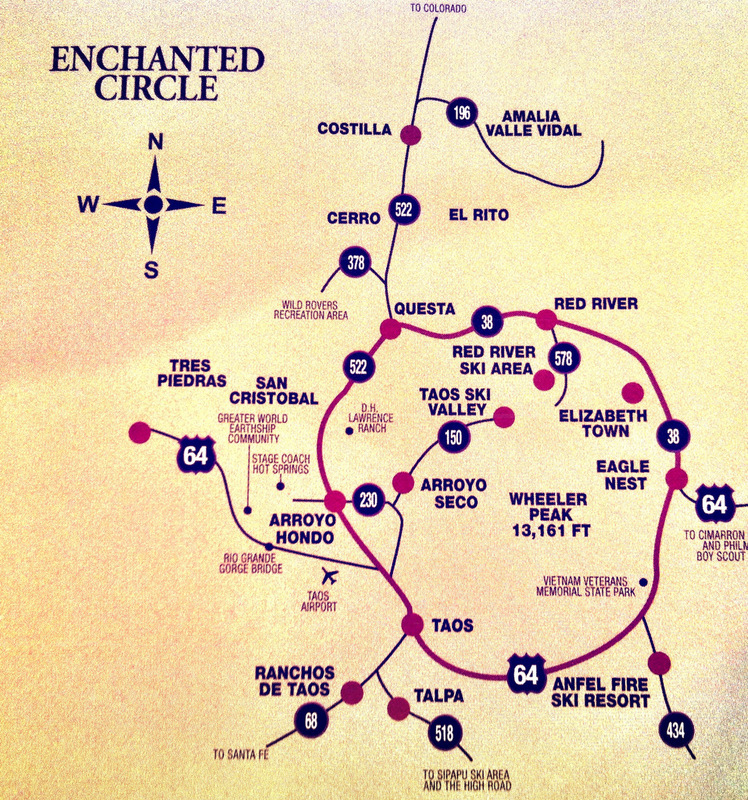 Almost everywhere we set out to go we ended up driving in circles; backtracking, getting lost or taking the very long way around. Since we had no agenda, we just took it in stride and I experienced a new feeling about “being lost”. It was almost liberating to not be the one in charge and to let go the frustration of taking a wrong turn and ending up somewhere totally off track. Eventually we just let this “confusion” have its way and instead of fighting it just surrendered our need for control and put ourselves in a joyful state of unknowing, following the whims of whatever force was guiding us. Because of this, we were able to experience a more innocent, childlike state of wonderment over the new, unexpected sites along the way. Enroute to somewhere unknown, we saw a road sign that sounded like a mineral hot spring not too far away. Of course, we made plans to go see it the next day. 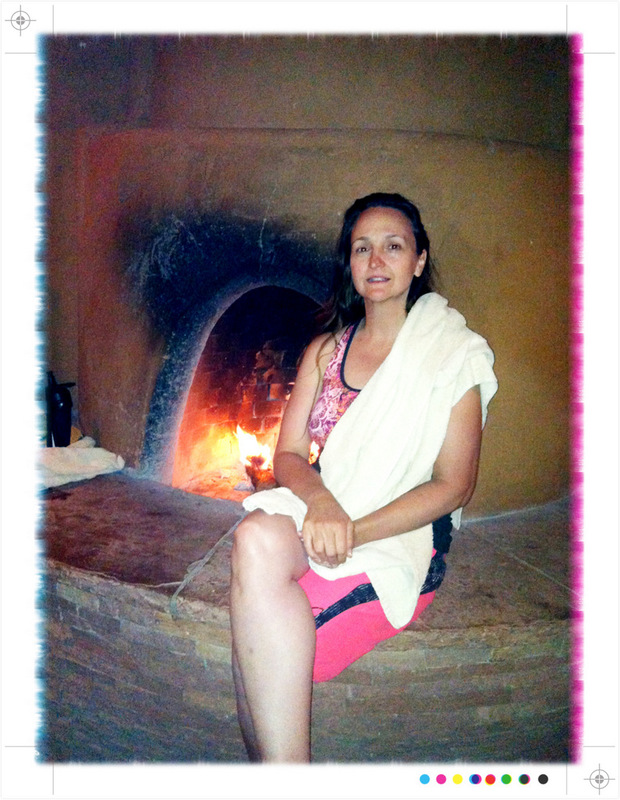 Ojo Caliente turned out to be the highlight of our trip. What an amazingly beautiful place it was. The grounds were tastefully landscaped. One of my favorite recollections of the whole experience were the hammocks situated beneath Viga styled roofs made from branches and twigs, the ancient people’s answer to providing shade in a hot climate. Ojo Caliente Mineral Springs Resort & Spa has been around for 145 years, one of the oldest natural health resorts in the U.S. Thus, the grounds reflect a true Mexican-Style architecture in the adobe buildings, pavers and viga roofing. You can feel the historical authenticity seeping from every nook and cranny, there is something very real and grounding about being here. I should add that a part of the spa experience is the people we meet at these places. People are drawn here with probably one universal goal in mind; healing of body, mind and spirit. A place like this includes the necessary ingredients; escape in a peaceful, quiet place setting in the midst of granite mountains serving as a natural barrier to keep the world at bay. The mineral waters draw a special kind of people. At a primal level we are seeking a sense of well-being. The mineral waters impart healing at a cellular level. Tradition tells us that often-warring tribesman would set their weapons and differences aside to gather in peace at these springs to enjoy the benefits of the waters, and to trade and heal their wounds and ailments without conflict. Some come to heal physical ailments, some just need a mental break and often we find an added spiritual uplifting as well. We have always met special people that we somehow connect very effortlessly with in our common search for extreme and poignant tranquility. The overall hushed sounds here actually do border on a sense of profound spirituality as people seek to withdraw from the world’s worries and cares, slipping into the steaming mineral baths and giving up the conflict, letting the healing waters wash them away during this retreat. One girl we met at Ojo Caliente remains a pleasant memory of the place itself. She, too, had taken a “sabbatical” from the rigors of her daily life and set out on her own private trip to come here and revitalize herself to be able to continue on with helping others. Her life had evolved into that of a spiritual healer and we had a wonderful conversation with her that helped remind us of where we, too, want to be on this life journey. I felt it was an inspiring conversation that we all took something away from. This is something I have come to expect, these random meetings wherever we go at these mineral waters. We find others with complete opposite lifestyles and experiences, living in entirely different places than us (we met a Japanese couple living on the northern coast of California at a mineral hot springs near our home that I will describe later on). We all have our own, unique experiences and yet a similar need that draws us, strangers, together for a common cause. In sharing our stories, this adds more depth to the experience. *Click on link below to reveal Ojo Caliente’s informative Website. New Mexico is a bit of second home for me. Nice post!